Would you like a beautiful landscape for your game to be played on? If so, these Land tiles are the answer. Whether you are looking for lush green grass or a field full of dirt and mud, these terrain tile sets will make whatever game you play spectacular. In the Crops & Fields set of our Land Series you have 70 double-sided tiles that include crop fill tiles, a variety of transition tiles and a supply of crop edges. This combination allows you to create a variety of crop fields in various shapes and sizes. On the reverse side will be a combination of dirt and grass fill. These tiles give you the option to construct an unplowed dirt field, a grassy field untouched by the planting process or a combination of both. If you are interested in “mixing it up”, the Crops & Fields set is the perfect addition to your Land series. The Large Roads set of our Land Series is designed for the gamer who wants large to X-large roads. 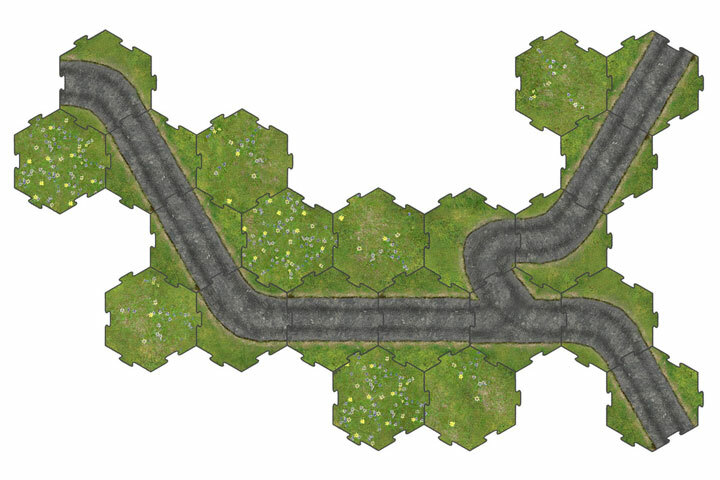 If you enjoy playing with a large scale and need larger roads, this set is made just for you. The set includes crossroads, curves, and straight options. Additional road fill is provided on the reverse side to give you the variability of size with maximum versatility for your road construction. The Large Trees set of our Land Series tiles includes 35 double-sided tiles. Each tree in this set is constructed using 3 to 5 of the standard tiles. 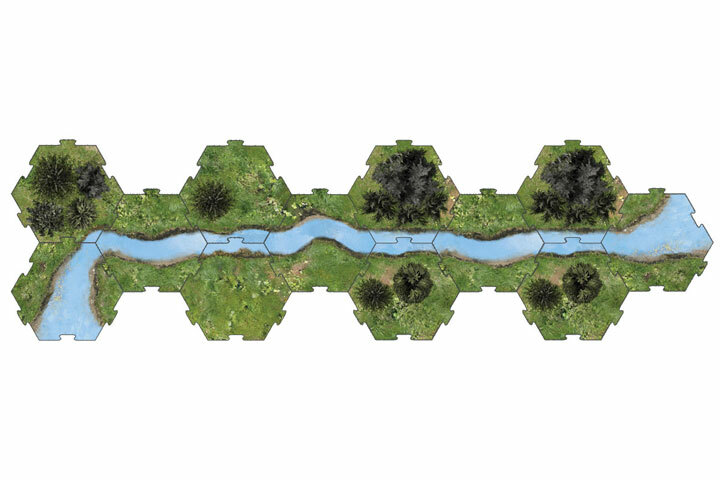 The Marsh set of our Land Series has an assortment of terrain tiles on the front depicting the Marsh terrain. On the reverse side of the tiles is a collection of flooded fields that will be perfect in creating a transition between Land and Sea or to be used in conjunction with your Stream tile set. This stunning collection of tiles will certainly enhance the beauty of your map. The Paths and Dense Trees set of our Land Series tiles have a variety of straights, curves and Y’s to give you added versatility in creating the desired direction of your path. The reverse side of the tiles contain a variety of dense trees. The beauty and flexibility of this set is certainly worth adding to your collection. 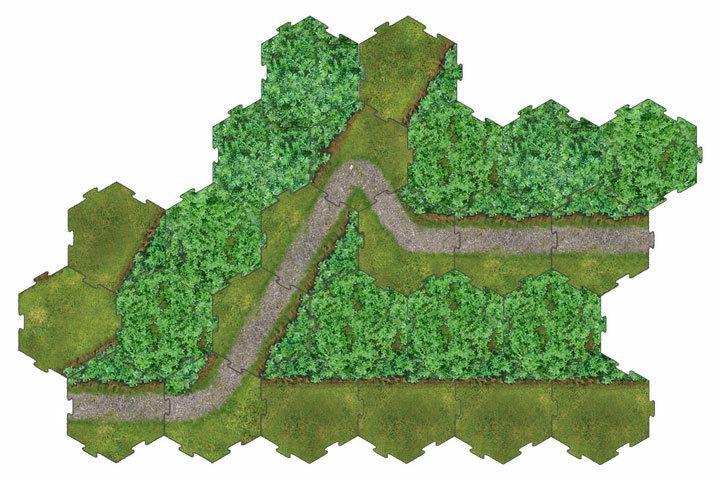 The Path set consists of curves, Y’s, and straight tiles to make a wide variety of path designs and on the back they have 35 open ground tiles and 35 dense tree tiles. The dense trees were designed to complement our Trees and Hedges set. Our first release in the Land series is the Roads & Meadows set which includes roads and meadows. 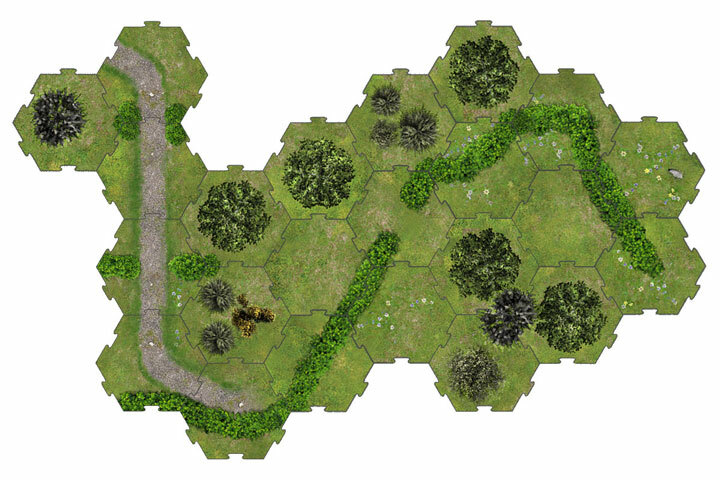 When you play your game using a traditionally printed map or board, the road is the same each time you play. But, when used with aPlace2Play Land terrain Road Set, you can create the direction your road will take; whether you want a straight direct route to get there quickly, or a road with Y turns or crossroads taking you on a can be changed as quickly as you can change your mind. 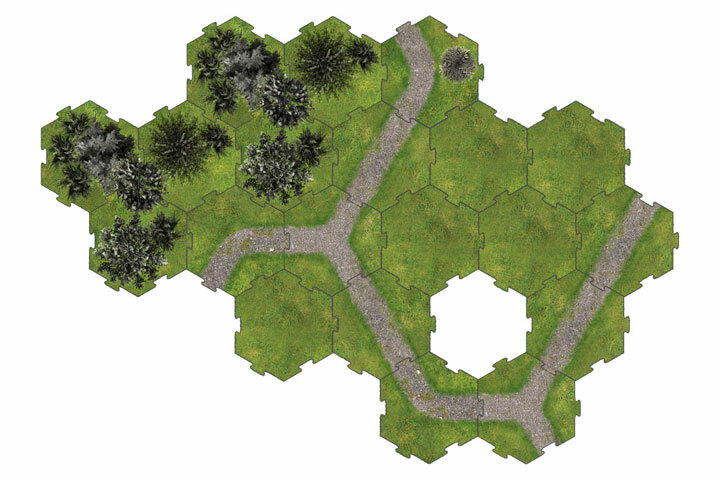 Also included in the first set as an accompaniment to your roads are a collection of meadow tiles. These tiles are beautifully illustrated with luscious green grass and vibrant flowers stretching as far as you would like to take them. The meadow tiles create a colorful and peaceful compliment to your roads. 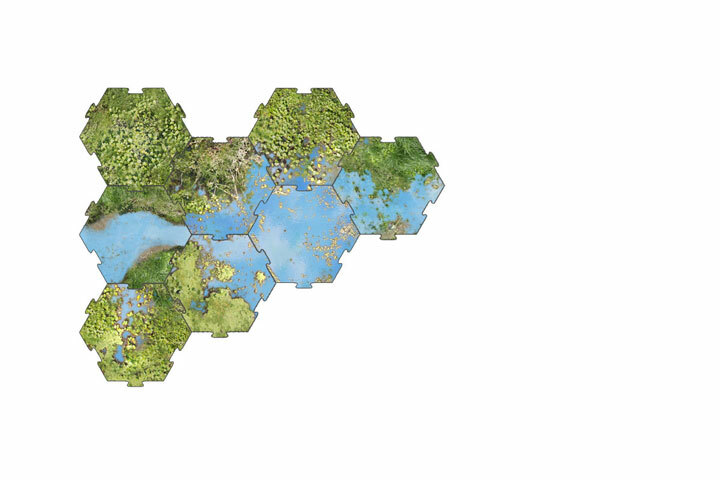 The Streams set of our Land Series tiles allows you to introduce water in various shapes and sizes to your map. Combine this set with the Marsh Set and you have a wetland that may be hazardous to cross. The Trees and Hedges set includes our double-sided tile feature with a large variety of trees in various shapes and sizes on one side of the tiles and the hedge row on the other. This design provides the maximum versatility whether you are creating the perfect hedge row with a lovely tree compliment, or designing a dense wooded area. 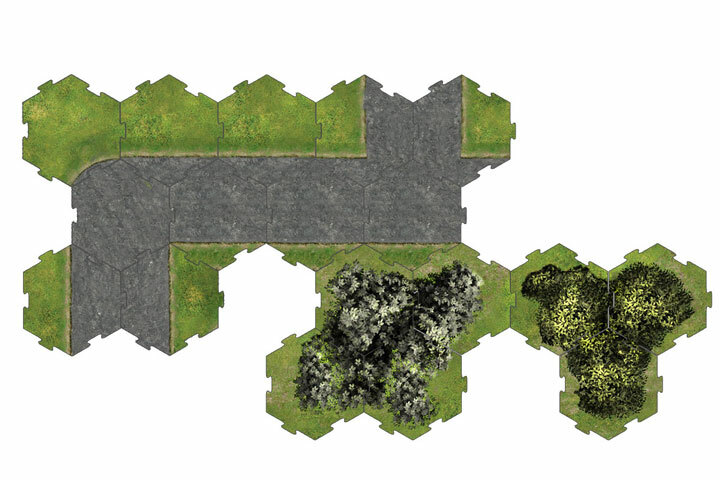 In addition, the color scheme and pallet for the grass fill under the trees and hedges corresponds to the fill tiles in the Roads and Meadows set; allowing you to create a seamless expansion for whatever you can imagine.